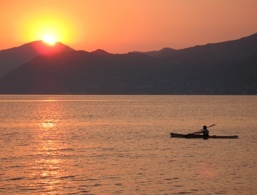 Canoeing & SUP - Discover Lake Garda! If you love sports action and at the same time peace, kayaking or canoeing on Lake Garda could be for you. With your canoe or kayak, you will be able to discover Lake Garda and its most beautiful corners, such as the coves, the gulfs, the cliffs rising out of the lake and the most remote beaches from a different perspective. 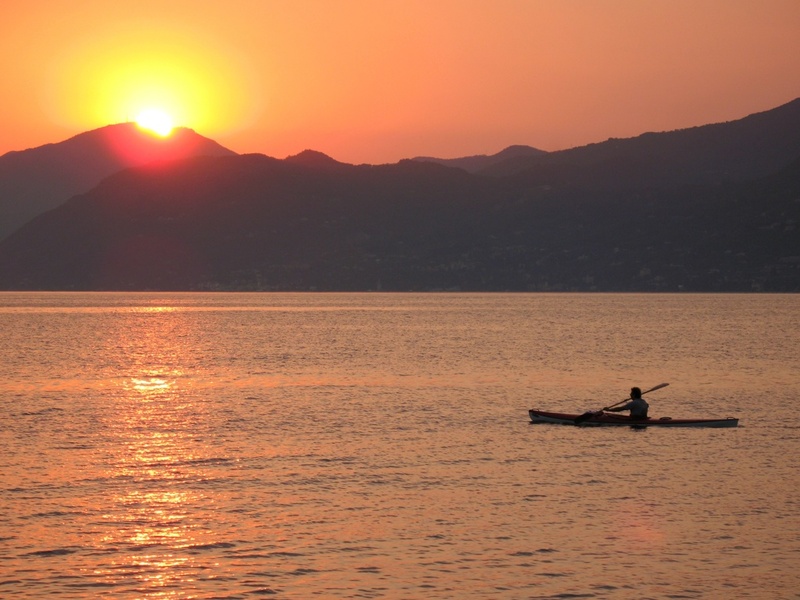 On Lake Garda, summer is undoubtedly the best time to go kayaking. In July and August, the wind drops, the water calms, and the less experienced canoeists can conquer the lake. Paddling fades into the background as the beauty of the lake impresses with its panoramic views. Surrounded by silence and tranquillity, free of loud industrious noises, you can enjoy moments in complete solitude or with your loved ones. If you want to surprise your other half with something really romantic, we recommend a sunset outing when the rays of the setting sun reflect on the lake and help it shine. With a Kayak you can explore not only the lake but also the countless streams and rivers. Experience magical moments and pure adrenalin! Canoeing is a prevalent sport that can be practised alone or in groups. In the competent hands of a professional guide, even beginners will feel safe. If you don't own your own Canoe or Kayak, you'll find that most popular beaches rent all the equipment you will need. An absolute novelty on the beaches and lakes around Lake Garda is unquestionably SUP or Stand Up Paddling which, despite its long history, only gained a foothold in recent years. The board is a mix of canoe and surfboard. You stand on it, and with the help of a paddle, propel yourself through the water and accelerate with the help of the waves. SUP can be practised without wind and inspires not only surfers but also canoeists. Since it's not very demanding, SUP is ideal for young and old and allows you to explore the lake and its surrounding nature. On the coasts, you will find various schools that offer courses and rental equipment.